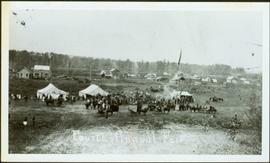 Photograph depicts crowd, horses, tents and flag pole in foreground with buildings and trees in background.Annotation on verso: “Fourth Fall Fair Prince George, Sept 1915". 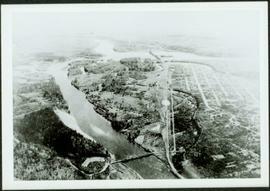 Aerial view of Prince George featuring roadways and the confluence of the Fraser and Nechako rivers.Annotation on verso: “Prince George from air 1936”. File consists of an oral history given by Alistair McVey, which was gathered as part of Dr. Mike Evan's Island Cache Recovery Project. Includes consent forms, transcripts, and the recorded oral history on the original media. File consists of an oral history given by Annius Van Driesum, which was gathered as part of Dr. Mike Evan's Island Cache Recovery Project. Includes consent forms, transcripts, and the recorded oral history on the original media. 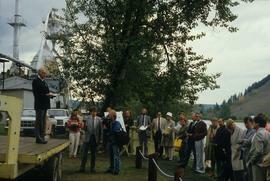 Image depicts a group of people in Cottonwood Park with an individual, possibly former mayor Elmer Mercier, making an announcement. 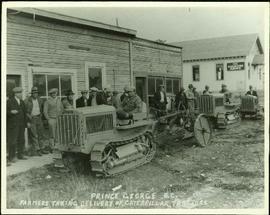 Series consists of original audio reels of CKPG radio programming broadcasts recorded in Prince George from 1960 to 1979, as well as, dubbed audio cassette copies made by the Prince George Oral History Group. 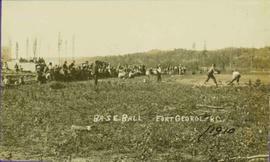 Photograph depicts crowd gathered to watch a baseball game in rustic field. 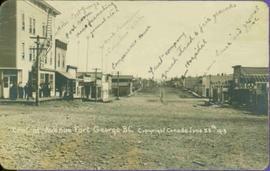 Handwritten annotation on recto reads: “BASE-BALL FORT GEORGE BC” added annotation in ink reads: “1910”. File consists of an oral history given by Bjorn Norheim, which was gathered as part of Dr. Mike Evan's Island Cache Recovery Project. Includes consent forms, transcripts, and the recorded oral history on the original media. File consists of an oral history given by Bruno Randt, which was gathered as part of Dr. Mike Evan's Island Cache Recovery Project. Includes consent forms, transcripts, and the recorded oral history on the original media. 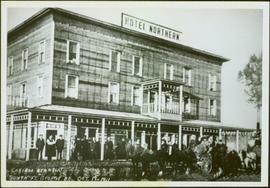 Photograph depicts large crowd gathered in front of three story building.Printed annotation on recto of photograph: "CARIBOO STAGE AT SOUTH FT. GEORGE B.C. 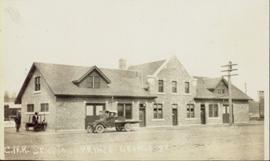 OCT 19 -1911". File consists of an oral history given by Cecil Nicholls, which was gathered as part of Dr. Mike Evan's Island Cache Recovery Project. Includes consent forms, transcripts, and the recorded oral history on the original media. Photograph depicts landscape with cleared land in foreground, river in middle, building and trees in background.Handwritten annotation on verso: "Central Fort George 1911". File consists of an oral history given by Chester Jeffery, which was gathered as part of Dr. Mike Evan's Island Cache Recovery Project. 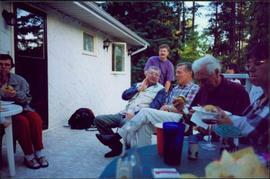 Includes consent forms, transcripts, and the recorded oral history on the original media.